My Earliest Movie Memories are probably not from the the first movie I ever saw because I may have been too young and I probably have no recollection of it. This is about my first recollection of something from a movie. All I remembered from that movie was the song John Jani Janardhan and a scene where people slip on marbles and throw cake at each other. I remember finding that scene hilarious and laughing a lot during that scene. Also remember that it rained while we were coming back from the movie. Many years later I would find out that the song John Jani Janardhan is from the movie Naseeb. Naseeb released in 1981 so I doubt that I saw the movie in the year of its release coz that would make me too young 😉 May be we saw it during a rerun a couple of years later. I re-watched the movie in the early 90s and did not like it much though. Anyways here is the scene I am talking about which I now don’t find it that funny 😀 Stop watching at 25 min. And here is the song John Jani Janardhan. So what are your Earliest Movie Memories? 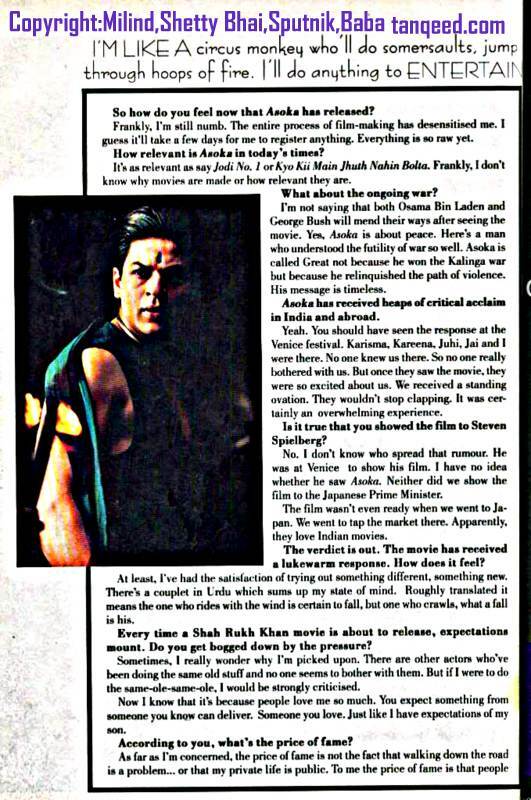 Special Feature: SRK’s Interview Post Asoka! Yesterday was Vinod Khanna’s birth anniversary. 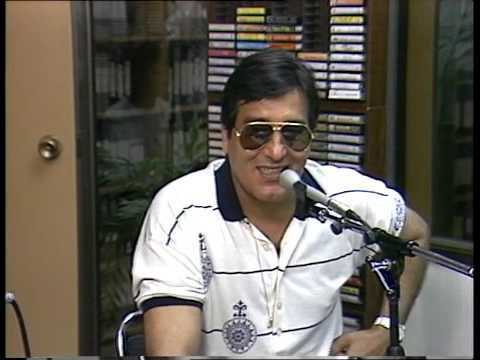 So check out this Vinod Khanna Interview from 1990. I don’t remember the name of the movie..but I do remember one scene..some kid is running behind the a truck to get to his family and he can not catch it (some lost and found type story). Second I remember distinctly is Noorie. Amar Akbar Anthony also has a scene where the kid is running after a car though and it is also a lost and found story. 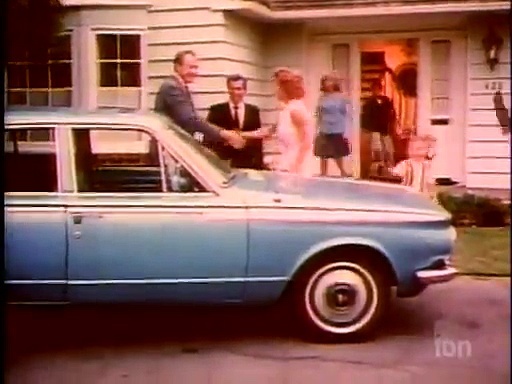 The car is way too close to the kid at 34 seconds. Saw this movie as a kid. It had a Sikh guy flying a plane and some nightmare scenes. Saw that movie a few years back. It was Govind Nihalani directed Vijeta starring Shashi Kapoor, Rekha, Kunal Kapoor (Shashi Kapoor’s son) and Supriya Pathak. It is a coming of age story about this guy who joins IAF and there is 1971 Ind-Pak war and there is back story of Shashi Kapoor’s family killed in partition. It was decent. There are lot of flight scenes with actual IAF planes but some of it looked like stock footage of IAF to me. some other films enjoyed a lot in my early days : basically because i had VHS of these films. Unfortunately My 1st movie in theatre was Singh is Kingg. I am one of the rare species who have watched all the akki movies in cinema till HF2 and than i decided never to watch a movie Starring akshay kumar in theatres. Yeah as a kid story used to go over my head too. All we cared as kids was “dishoom dishoom” scenes. There was one movie of Amitabh where there is some kidnapper who kidnaps his son or something like that and a dog is killed. May be am confusing two different movies. And for some period of time, I use to think the actors were behind the Screens. Once My father had a bet with me that i cannot find old movies in my village… Bet worth 500 rupees and he named a movie Shri 420 randomly… within an hour i brought that video cassette and won the bet but that film made me watch many other old movies as well…. I still don’t watch more than 5-6 movies a year in theater. We were taken by our school to some children’s movies like Nanima and another one on animals which I think was called Beautiful People/Animals. My father used to take us to movies which he saw when he was young. So we were taken to movies like Shri 420, Mere Mehboob and The Ten Commandments. Remember watching songs Mera Jhoota Hai Japani, Ichak Dana, Mudh Mudh Ke Na Dekh and Ramaiya Vastavaiya from Shri 420. Remember watching title song of Mere Mehboob and some comedy scene involving Johnny Walker where he comes in disguise as old man I think. Also remember the sea parting scene from The Ten Commandments. I remember there was some James Bond movie trailer during The Ten Commandments and I wished my father took us to that movie 😉 The only new movie we probably saw back then was Nikaah. Remember watching Dil Ke Armaan song from the movie. I think the movie went over my head and I was bored. Saw the movie again in the 90s and liked it. when in the film,that scene came and srk didnt break any pillar, i got seriosuly pissed and i ruined the film for everyone. later i saw the film again at home and i relealised my cousin may hv been talking about that scene in koyla where srk emerges from a debris.that scene is shot in a way that it seem srk broke somehting. Watch from 0.09 to 0.10. I thought the koyla trailer was good. I even remember its making. srk had set himself on fire in one scene for real. I was quite impressed. there was a bihari women beside me.when amrish was torturing madhuri.she said ” ee harami ka narkay hoyi”. LOL on your Koyla pillar story. I did not see any SRK movie in theater after Dil Se till Rab Ne. Actually I did not see any Hindi movie from Dil Se to Laga Raho Munnabhai in theater. FS had mentioned watching movies on VHS and my comment was already long so did not elaborate. The first movie I saw on video cassette was Sholay in 1989. I was at my friend’s place and his elder brother borrowed VCR and a video cassette from their neighbor. I think they had recorded the movie on the video cassette and it was not even full and ended at Amitabh’s death scene. After Amitabh falls backward and shoots the guy on top of train I started liking him. I became a Amitabh fan after watching that movie. Now I had to watch the whole movie at any cost. Luckily my grandparents visited us after a few days and I forced them to take me to Sholay. 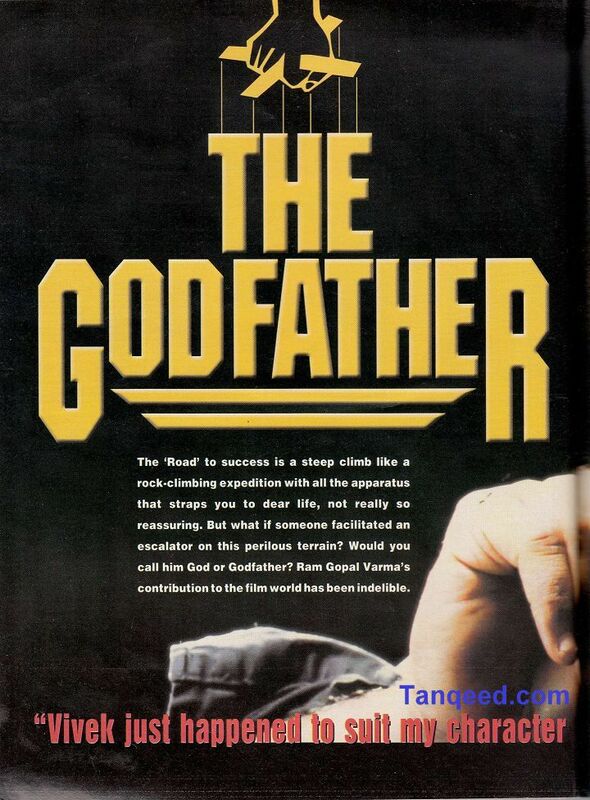 I loved the movie but did not like the Sanjeev Kumar jumping in air scene to kill Gabbar even back then. My friends’s family at whose house where I saw Sholay were big movie buffs. Father was Dilip Kumar fan, mother both Dilip and Amitabh fan and kids Amitabh fans. They would rent VCP for 12 hours for 25 rupees and would watch 4 movies by fast forwarding the songs. Saw Aaj Ka Arjun, Khuddar, parts of Geraftaar and Trishul there. Saw Dil, Ghayal, Aashiqui back to back. We kids wanted to watch Ghayal because it was action movie but had to watch Dil first because my friend’s elder sister was Aamir fan and she had to go to typing institute later. When my cousins came to visit us I thought I will rent a VCP and watch 4 movies at our home too but the plan kind of backfired. The Video renter was chalu and he fooled us. He had a bad Video cassette but convinced us that it was our TV fault and made us rent a color TV for 20 rupees for 12 hours and he wasted a good 3 hrs in the whole TV thing. We started watching Baaghi which was the new release but my elder cousin sister did not like it. She said why is Salman “Nanga” because he was wearing shorts and probably shirtless in initial scenes. So we returned the cassette. Watched Thanedaar instead. Then saw Coolie and I did not like it. My sister looked at me with disapproving eyes for torturing them with Coolie. We then started watching Jaanbaaz which was my choice but had to stop that too coz it had scenes which made everyone uncomfortable. I think we may have also watched Ek Phool Do Mali because of my aunt. 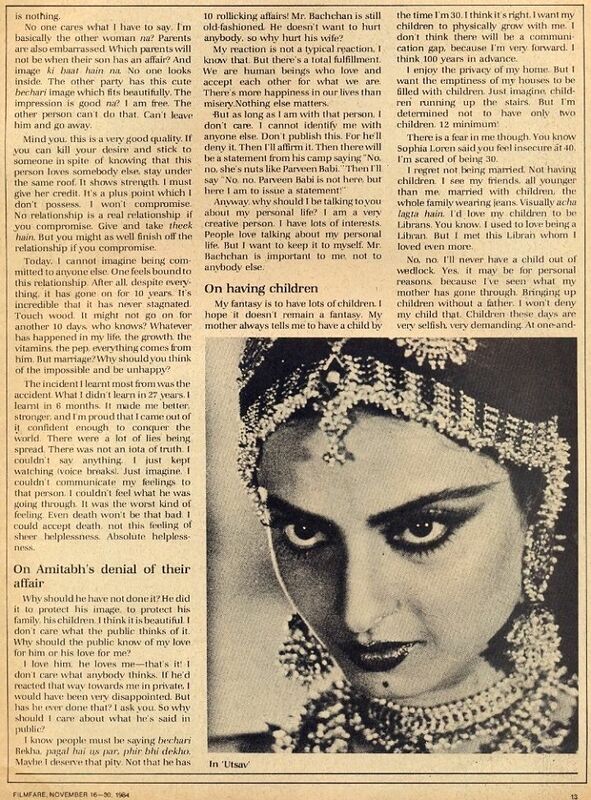 When I went to visit my grandparents I remember making my Mama take me to a video store so that I can find some Amitabh movies to rent. It was hard to find Hindi movies there. Watched Naseeb 😀 which I did not like much and Ram Balram which I surprisingly liked at that time. On another visit saw Mard and I hated it. Everyone made fun of all the nonsensical stuff in the movie. My oldest memory of Hindi films is Madhuri’s ‘Ek Do Teen’ song and glimpses of Tehzab scenes – like that song while the entire group is inside the van driving through the night. Memories of a first full movie is perhaps QSQT – still liked the innocence of that film when i revisited it a few years back. LOL on bikes diverging part. I remember seeing Ajay’s picture in a newspaper before Phool Aur Kaante’s release and thinking anyone can become an actor now. I used to dislike him in the hit songs from the movie that used to come on Chitrahaar back then. So I decided not to watch the movie. But then my cousin watched the movie and he could not stop raving about the movie and the action scenes. He described the bike scene to me in detail. So I watched the movie on the 91st day and as soon as I saw that scene all my dislike for Ajay disappeared. I liked his action scenes and also his acting in the movie back then. ajays entry scene in phool aur kaante qualifiies as one of the greatest entry scenes ever in bw. Yeah Phool Aur Kaante was one of these good old-school college action movies … a similar movie that also forms my early memories is Shiva … Nagarjuna chasing the villains through the college corridors. Same way when i revisited MPK (my all time fav) recently, except songs & few portions, i did not like it… I guess samething may happen if i watch many other old hits/bb. Earlier i use to compare ajay & akshay & think ajay wud beat the hell out of akshay or any other hero if he is put against anyone. Later when i saw Sunny Paaji’s Ghayal, i forgot abt ajay or akshay or shetty… It was just sunny for me – sheer Raw Power.